Cooler Master announces it will use horizontal vapor chamber technology in the V4 GT processor cooler, a new model anticipated to be released later this quarter. Cooler Master announces further integration of Vapor Chambers into its retail Heatsinks. 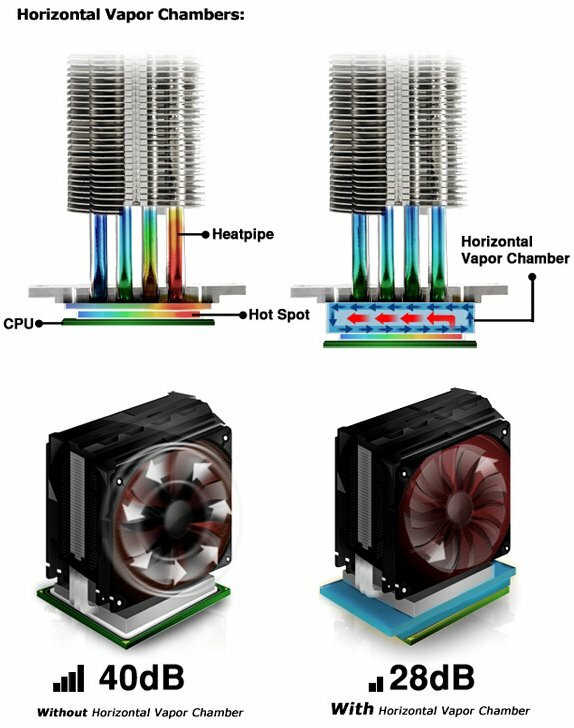 After releasing the world's first heatpipe heatsink in 2000, and the first vertical vapor chamber Heatsink in early 2012, Cooler Master today announces broader adoption of Vapor Chamber Technology developed by Cooler Master's OEM and industrial cooling division in its retail Heatsinks. After the success of the TPC812 pioneering the use of modern vertical vapor chambers, Cooler Master is expanding the TPC series and will equip selected Models of the V series with Horizontal Vapor Chambers. Horizontal Vapor Chambers spread Heat 8x faster than solid copper, eliminating hot spots and spreading heat evenly across the base of a heatsink. Since the vapor chamber effectively increases the heatpipe contact area, it allows the use of a larger number of heatpipes. Overall Horizontal Vapor Chambers enable faster and more efficient transfer of heat from the CPU to the heatpipes and fins, resulting in lower temperatures and slower, less noisy fans. Modern processors feature multiple CPU cores and integrated GPUs, resulting in hotspots, tiny parts of the CPU that product significantly more heat than others. Thanks to advanced thermal management, processors can boost the speed of individual cores if the processor is cooled well enough. Horizontal vapor chambers help eliminate hotspots and remove heat at unprecedented speeds, allowing your CPU to boost its performance and notably improve system performance. Vertical Vapor Chambers allow Cooler Master to develop Heatsinks that help your system run cooler, quieter, and faster. The first Cooler Master Heatsink equipped with a horizontal vapor chamber, the V4 GT, will be officially released to the market in Q3, 2012.